Decorate Your Fence This Winter! 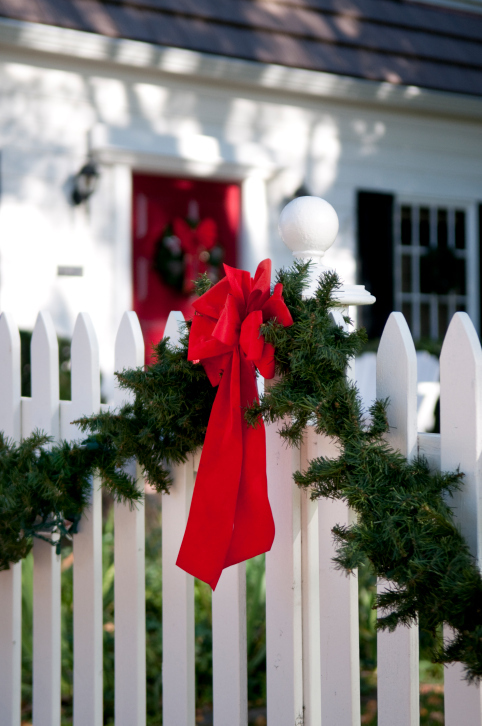 Decorating your fence makes your entire home look festive! If you have a fence on your residential property, you understand how your fence is essentially an extension of your home. It’s also the first thing people will see when approaching your property. You can help to give visitors a good impression of your home if you decorate your fence for the winter! Read on for some ideas on how to decorate your fence to brighten up your property this winter. Decorate your fence with a wreath for a classic touch that evokes the cheerful holiday spirit! Just a single wreath placed upon a gate can give your home a cozy winter feel. You can also place wreaths around each fence post and string garlands of pine, holly, or ribbon in between for a more comprehensive decoration. Add some ornaments and pinecones and pretty soon your home will look like it came straight out of a Currier and Ives print! Lights are an especially great decoration for fences, because not only do they accentuate your fence, but they also draw attention to other holiday decorations you may have in your yard. If you plan on stringing lights on your home for a holiday light display, then extending the lights to your fence will make the whole display look more expansive and impressive. If you own a vinyl fence and really want to go all out with your holiday display, consider buying a projector! A solid white vinyl fence acts as a canvas for projected images, so you can impress and entertain your neighborhood with projected seasonal images! This entry was posted on Friday, December 4th, 2015 at 2:41 pm. Both comments and pings are currently closed.